Having spent years ageing beers in barrels, most famously using Starward barrels when creating the iconic Ramjet imperial stout, Boatrocker's Matt Houghton decided that 2018 was the time to go a step further. Dramjet is the result: a blend of the most recent vintage of Ramjet with some of Starward's whisky, the aim being to "push your boundaries of what is beer, and what is whisky". In the case of Dramjet, it's an intentionally still, viscous beast with the hue and glamorous glisten of an old sherry, complete with whisky aromas that hit you before you pick up the glass and weighing in at close to 18 percent ABV. There's heaps of the caramel, vanilla and choc fudge characters you've come to know and love from Ramjet, but with a more spirituous top note. 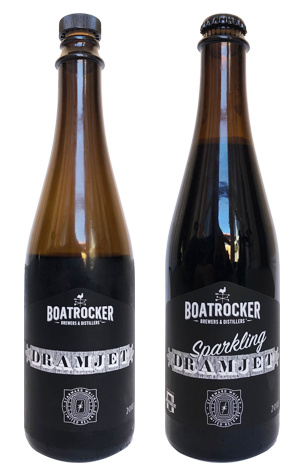 Its release has been followed by Sparkling Dramjet, a twin identical in all ways other than the fact it's carbonated. It's a single change that makes a pretty significant difference, however, lifting the whisky characteristics above those of the more chocolaty original and, if anything, delivering a more potent and rewarding experience. There is actually a second difference. Straight Dramjet comes with a cork so can be shared over more than one sitting; it's not a luxury afforded the sparkling version so make sure you open it with a few mates – or have nothing of great urgency to do the next day.